Tentsile's Giant Pegs are a quick and easy solution to placing stakes in hard soil when a rock or hammer is not readily available. 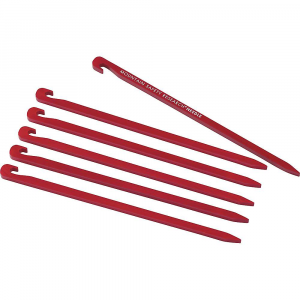 This reviewer found these pegs so handy, he is left wondering why screw-in tent stakes are not more common. Recently, I tested and reviewed the Tentsile Flite for Trailspace. 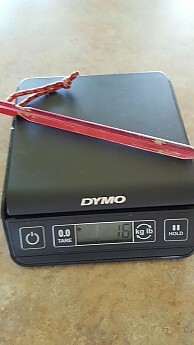 While I did not care much for that product, I did find the stakes that came with it to be superior to the cheap J-stakes that normally come with a tent or tarp. In fact, I felt these X3 Giant Pegs deserved their own review. 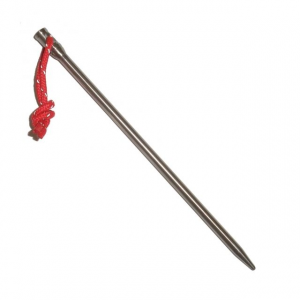 Unlike other stakes that are driven into the ground by force, the X3 Giant Peg screws into the ground by hand. There is no need to use your foot, a rock, or a mallet. One simply presses down and screws the stake into the ground. 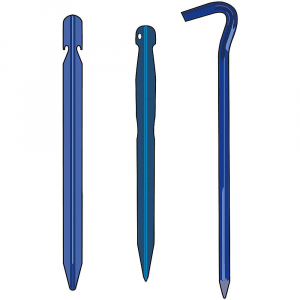 As such, there is no concern for bent stakes (common on J-stakes) or broken heads (common on plastic stakes). In all soil conditions I tried, it never took me more than a few seconds to screw a stake into the ground. 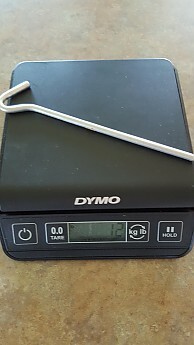 The Giant Peg measures in at 8 inches, which is a full inch longer than my MSR GroundHog stakes and the cheap J-stakes that come with nearly every tarp I buy. 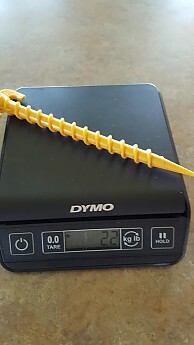 At 22 grams, it was the heaviest of the 3 stakes. I was surprised the Giant Peg did not hold up as the superior stake in loose soil and sand. I had thought the screw-in motion would make it harder to pull out. However, that is not to say it failed. It fared just as well as the GroundHog stake, and it was superior to the J-stake. 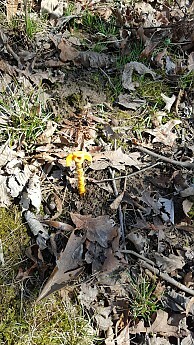 But it is in hard and rocky soil that I really like the Giant Peg most. I found no situation, where I could not screw one in by hand. There was never a need for additional force. 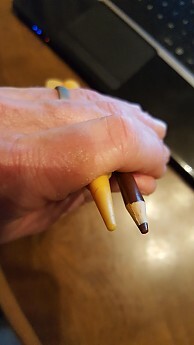 Once set into clay soil, I could not pull a peg out of the ground, even on a straight line pull, which is not the way anyone would set a stake to begin with. It had to be screwed out roughly 50% before I could pull it out. In my final test of the Giant Peg, I drove over to a local RV park and tried driving all three stakes into a gravel pad. Unsurprisingly, both the J-stake and the GroundHog required a little hammer persuasion, and had to be moved around a bit to get them to go in. 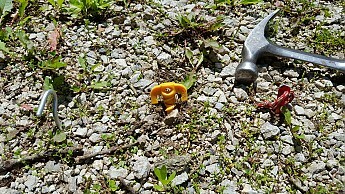 The Giant Peg, just screwed right down through the gravel, and took a solid hold in the soil. One last "pro" is the blunt tip of the stake. 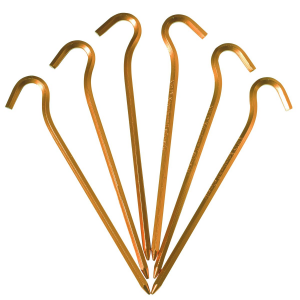 When I hike, I always clip my aluminum GroundHog stakes to the outside of my pack out of concern the ends might tear a hole in something. 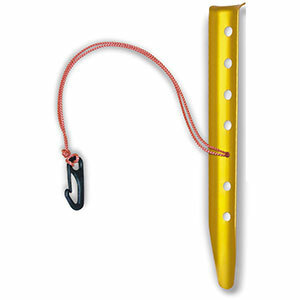 The end of a Giant Peg is reminiscent of a colored pencil, and, being plastic, I am less concerned about gear being damaged. Of course, I would still advise caution. 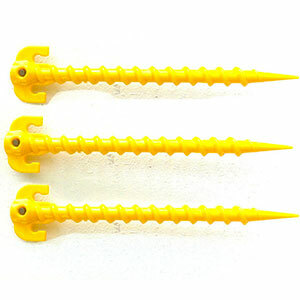 Gram counters are probably not going to fork over $15 for three Giant Pegs. 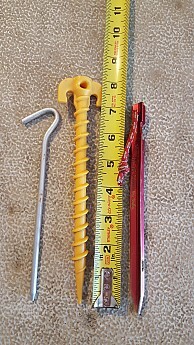 But hikers tired of bent J-stakes and fighting to get stakes set into the ground may want to look at these. Folks who car camp at campgrounds using gravel pads might also be interested in them. Nice review, Goose. I appreciate that you took the time to call out these Giant Pegs which did work well for you. I would love to find something like these but made of metal. I can't get anything into the ground here in winter. Even normally soft soil turns to rock in winter. I've crushed aluminum, titanium, steel trying to pound it in. 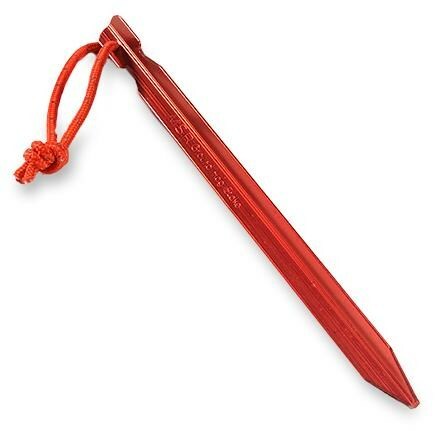 I also don't want to carry around a beast stake with a power drill just to get my tent secure. At present, I tie my tent off on small logs and bury the logs in the snow. What an interesting concept. I would be interested to try some out sometime. Well done! The Tentsile X3 Giant Pegs is not available from the stores we monitor.